Add uPVC French Doors like these to your home. We install uPVC French Doors across Bournemouth, Southampton, Portsmouth, Salisbury, Fareham, Hedge-End and surrounding areas. To ensure our French doors are a worthwhile investment for your home, we offer a design that utilises a market-leading uPVC profile. This means that they are able to achieve an unrivalled standard of thermal efficiency, security, durability, design, and performance to make your home a safer and more comfortable place to be. 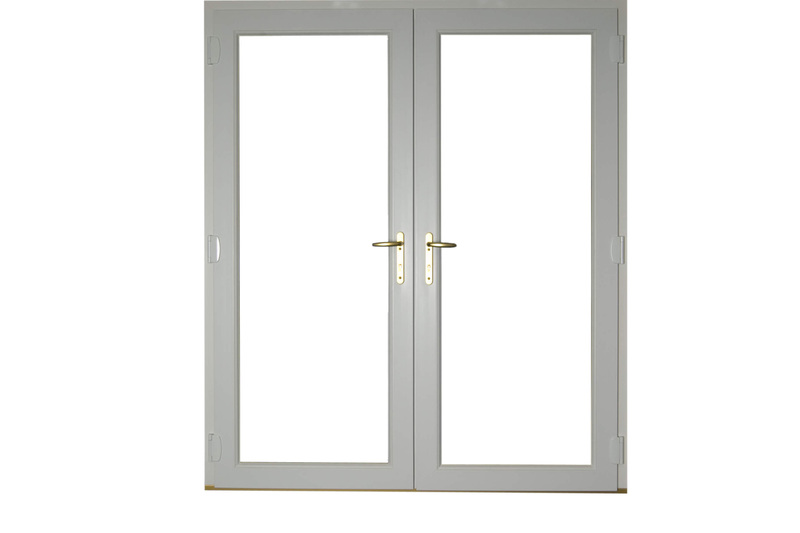 This also means that they will stand the test of time, even after extensive use, and feature door restrictors for safe operation.We know that making a house a home often requires a personal touch, which is why we are able to offer you French doors that are versatile in their installation. They can be customised through a range of hardware and colour options to make them meet your tastes and property style. It won’t matter if your home is modern, traditional, period, heritage, or new build, we’ll be able to offer you the ideal door design. Although our uPVC French doors are able to offer you increased accessibility, they’ll still work to keep the elements at bay and your comfort in mind. This is made possible by a thermally efficient profile that combines multiple chambers and weather sealants to trap in pockets of warm air. This means that the warmth from your central heating will stay in your property for a longer period of time, allowing you to stay comfortable during the colder winter months. Increasing the heat retention of your home to an A+ WER standard brings more benefits that just keeping the chill off, it could also help you to save money too. This is achieved by lowering your reliance on your heating to keep your home comfortable, which means that you could find yourself lowering your heating bills as a result. Further to this, less heat escaping your home also helps to reduce your carbon emissions and carbon footprint. To keep the modern intruder away from your home, all of our uPVC French doors are manufactured to the highest security standards. They achieve this by combining a premium grade uPVC profile, modern manufacturing techniques, and professional installation to maintain an impressive degree of structural integrity. The profile that we offer comprises internal structures that ensures they can withstand an attack from a would-be intruder. All of our uPVC French doors are also fitted with high-security locking systems that engage at multiple points of the frame to ensure any weak spots are avoided. These locks are integrated into the frame to ensure they can’t be used as a potential leverage point to gain access into your home, ensuring you are able to bring a door design to your home that ensures you are protected against modern burglary techniques. Getting the right uPVC French door for your home is made easy through our comprehensive colour selection, including a range of woodgrain foils that enable you to bring a timber look to your French door without having to worry about the headaches of maintenance. We’re sure to have the right colour to suit your home. Due to the inherent qualities of uPVC, our French doors are incredibly low maintenance by design. This means that they will require very little input from you to ensure they perform and look at their best. All you will need to do is give them a quick wipe down with a damp cloth, and you’ll never have to worry about any rotting, warping, cracking, or discolouring. All of our uPVC French doors are installed by our expert team to ensure you enjoy the highest degree of quality. We have refined out approach over the years to achieve the highest standards of professionalism, efficiency, promptness, and respect for your time and home. There is no reason for you to settle for anything less with Fortuna.